Well where did January go then? It just slipped past so quickly I hardly noticed it. They say time flies when you are having fun, but I am not sure this is really the case. 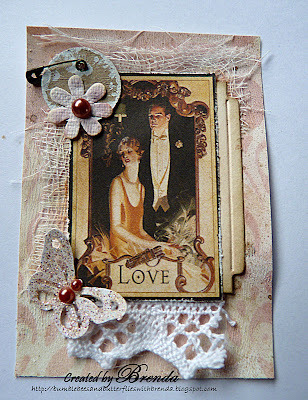 Anyway - it seems ages since I have made an ATC and I loved making this one - shabby vintage yet again. The background was made with Starburst Stain and Moonglow sprays and gesso layers, then stencilled over with DI. The image is Graphic 45 Le Romantique set and I have added cheesecloth, lace and other small embellishments to finish it off. Moon Glow - Golden Pumpkin Blush, Phantom Fuchsia. Why not pop over to the Stamp Man ATC blog and join in. You could be the proud owner of a set of ATCs in return. Wonderful shabby ATC...I haven't made an ATC in over 2 years...I think I need to!! Gorgeous ATC, love the trimmings. 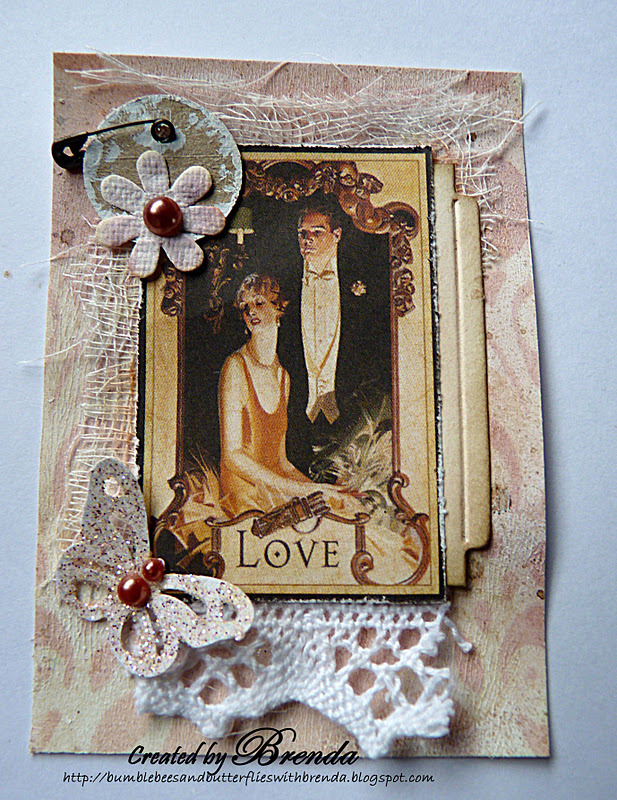 gorgeous atc Brenda,lovely layers and colours and Romatique G45, what else could anyone ask for ! Hi Brenda, how is it possible to get so much gorgeousness onto one little ATC !!!!!!. Lovely, darling, piece that couple a just super and you have created a lovely nostalgic piece. A stunning ATC with the most beautiful colours and shabby details. This is gorgeous, lovely trimmings and a beautiful image. Oh this is gorgeous Brenda. Gorgeous! love that cheesecloth layer! This is gorgeous! I love all the beautiful details. It's a wonderful ATC with great details.